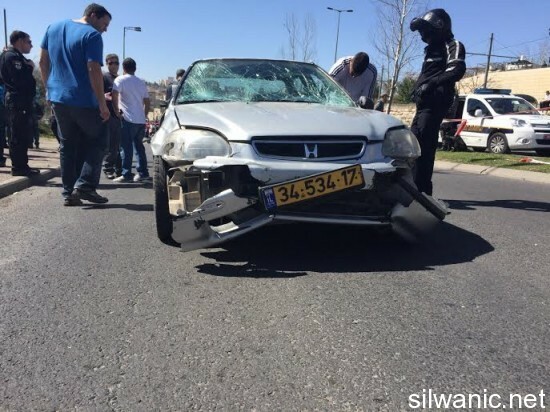 The Wadi Hilweh Information Center (Silwanic) in Silwan, in occupied Jerusalem has reported that a young Palestinian man was shot and seriously injured by Israeli army fire, after the soldiers alleged he deliberately struck some soldiers with his car on Street #1 in Jerusalem. The seriously wounded man has been identified as Mohammad Mahmoud Salaymeh, 22 years of age. Israeli sources said the young man ran-over a group of soldiers, wounding five. Mohammad is from Ras al-‘Amoud neighborhood in occupied East Jerusalem. A lawyer with the Ad-Dameer Prisoner Support and Human Rights Association said Mohammad, who is currently receiving treatment in Hadassah Ein Karem Israeli hospital in Jerusalem, would undergo a trial in absentia, on Saturday evening, to extend his arrest for interrogation. The lawyer, Mohammad Mahmoud, said the police and Israeli Internal Security officers, interrogated the father of the wounded young man, and his brother for seven hours. They were released later, but were ordered to return for further interrogation on Saturday at noon. The father said he and his family only knew about the incident on TV and Social Media outlets. He added that his son left home in the morning to look for work, but two hours later, the family heard news about an attack in Jerusalem, and that is when they saw images and videos of their son, wounded and lying on the ground with soldiers surrounding him. Following the incident and the shooting, clashes took place in different parts of Silwan, and the soldiers kidnapped a child, while a young man (Mousa Abu Rahmeh, 18) was shot by a rubber-coated metal bullet in the face. 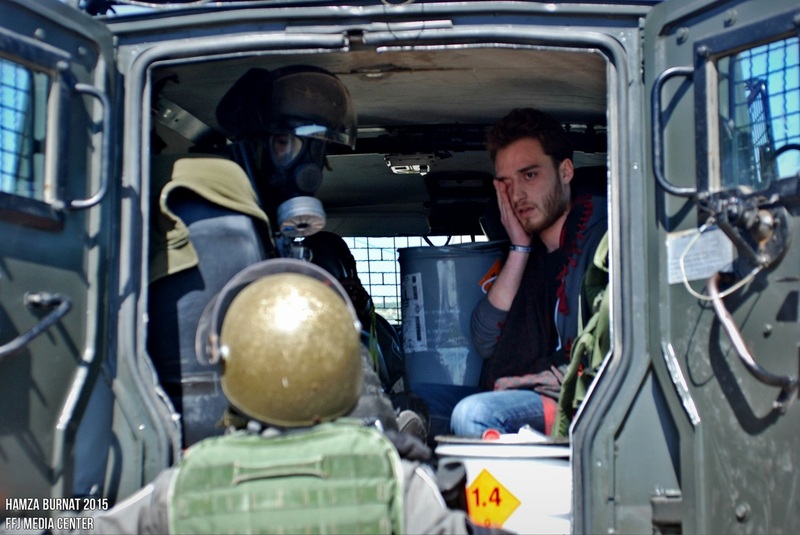 Silwanic said that Israeli guards of an illegal outpost in Beidoun neighborhood also provoked two young men, and sprayed their eyes and faces with pepper-spray. A police car then arrived at the scene, and clashed with local youths, before kidnapping a child, identified as Mustafa Beidoun, 14 years of age, while standing in front of his family’s home. In ‘Ein al-Lowza neighborhood, a young man was shot by a rubber-coated metal bullet in his forehead just above his eye, during clashes that took place with invading Israeli soldiers, and the army fired dozens of gas bombs, concussion grenades and rubber-coated metal bullets. In addition, undercover soldiers invaded a home, belonging to Sheikh Sabri Abu Thiab, and occupied its rooftop after searching it. Dozens of soldiers and police officers also invaded Abu Tayeh neighborhood, and hurled a number of sound bombs. Furthermore, clashes took place in the Schools Street, and the Shayyah neighborhood, in Ras al-‘Amoud after the soldiers invaded them. 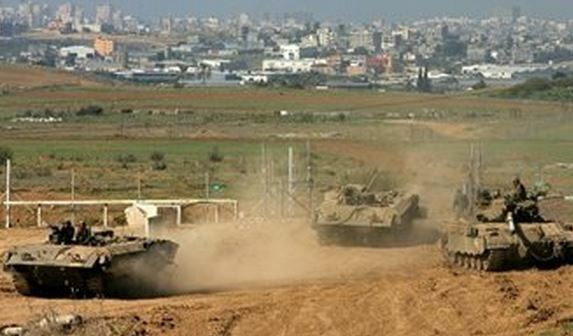 Israeli forces deployed on the border east of Khan Younis opened fire at Palestinians on Friday. Witnesses report the shots were fired on Palestinians in their agricultural lands in eastern al-Qarrara, north of Khan Younis in the southern Gaza Strip. An Israeli army spokeswoman told Ma'an that soldiers fired warning shots as Palestinians approached the fence, after which the individuals turned back. Palestinians whose agricultural lands lie close to the buffer zone between Gaza and Israel have reported open fire from Israeli forces as a routine occurrence. The al-Mezan Center for Human Rights reported that Israeli forces have opened fire at the Gaza border 29 times since the Aug. 26 ceasefire agreement between Israel and Palestinian militant groups, killing two Palestinians and injuring 35, including nine children. The ceasefire agreement marked the end of a devastating 50-day war that killed more than 2,000 Palestinians, 73 Israelis, left 100,000 Gazans homeless and large swathes of the territory in ruins. 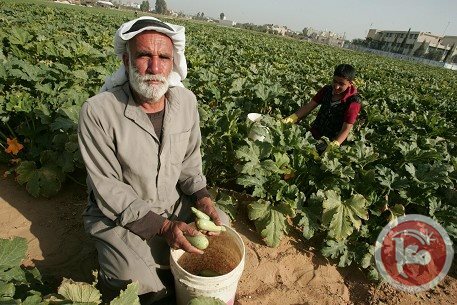 Occurrences of live fire can deter farmers from accessing their farmland, worsening agricultural production in Gaza, where over 80 percent of the population is food insecure, according to the Food and Agricultural Organization of the United Nations. Israeli soldiers shot and injured three Palestinian civilians, and kidnapped four international supports, during weekly nonviolent protests organized in West Bank villages on Friday midday. 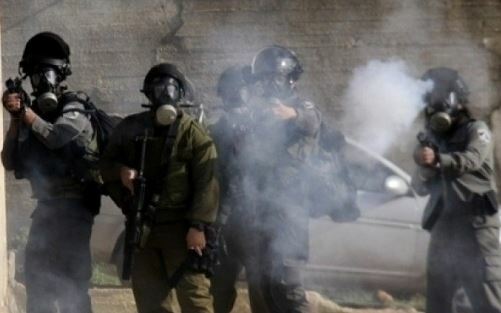 Two villagers were injured and many more were treated for the effects of tear gas inhalation as Israeli soldiers attacked the weekly protest organized in Kufur Qaddoum village, near the northern West Bank city of Qalqilia. Eyewitnesses said a 17 year old teenager was shot by a live round in his leg, and another was hit by a gas bomb in his arm. Both were moved to a hospital for treatment. Moreover, a Palestinian sustained light wounds, while four French supporters were kidnapped when Israeli forces attacked the weekly anti wall protest in the central West Bank village of Bil’in, near Ramallah. In Ni’lin village nearby village, soldiers attacked protesters with tear gas, causing many too suffer the effects of tear gas inhalation. In the nearby Nabi Saleh village, Israeli troops fired several, and rubber-coated metal bullets at the villagers as soon as they reached the village entrance. 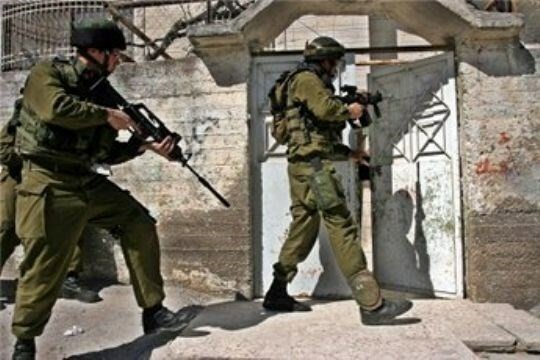 Moreover, Israeli troops fired tear gas at residential areas causing damage to the houses as some of the tear gas canisters went through the windows inside the villagers’ homes. In the southern West Bank village of al Ma’sara, Israeli troops attacked the villagers and their supporters at village entrance then forced them back using rifle buts and batons, no injuries were reported. Clashes took place, on Friday afternoon, after Israeli soldiers invaded various areas in Hebron and Bethlehem, in the occupied West Bank. In Bethlehem, Israeli soldiers fired gas bombs and rubber-coated metal bullets during clashes with Palestinian youths near the main entrance of the ‘Aida refugee camp, north of the city. Similar clashes also took place in the Um Rokba area, close to Israeli bypass road #60, in the al-Khader town, south of Bethlehem. In addition, Mohammad ‘Awad, Spokesperson of the Popular Committee against the Wall and Settlements in Beit Ummar, near the southern West Bank city of Hebron, said dozens of soldiers invaded the ‘Aseeda area at the main entrance of Beit Ummar, and clashed with local youths. The soldiers fired gas bombs, concussion grenades, and rubber-coated metal bullets on the Palestinian protesters. The army claimed the invasion took place after a number of Palestinian youths hurled stones on settlers' cars by bypass road #60. Israeli soldiers attacked, on Thursday afternoon, a number of Palestinian police officers chasing a suspect who tried to run away through an Israeli military roadblock close to the Bet El military base, built on Palestinian lands near the central West Bank city of Ramallah. The incident was partially captured on video that was published by PalMedia agency. Media sources in Ramallah said the Police were chasing the suspect who fled towards the Israeli roadblock, when the soldiers intercepted them, attack them, and forced them to surrender under gunpoint. 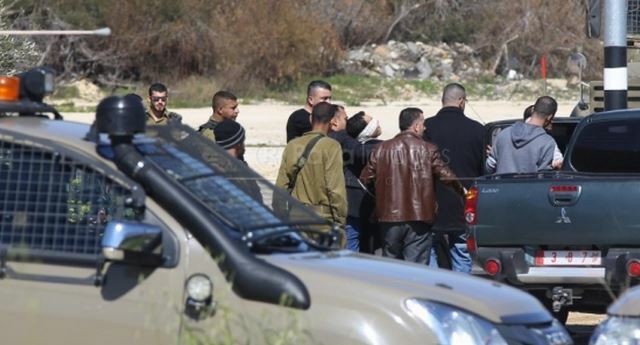 The Raya News Agency stated the soldiers detained the Palestinian Police officers for several hours. Palestinian controlled areas in the occupied West Bank are largely isolated by Israeli colonies, military camp, and roads that are under full Israeli military and security control. In many previous incidents, the police had to quit chasing persons, suspected of committing crimes or felonies, because they managed to drive into West Bank areas that are under Israeli control. 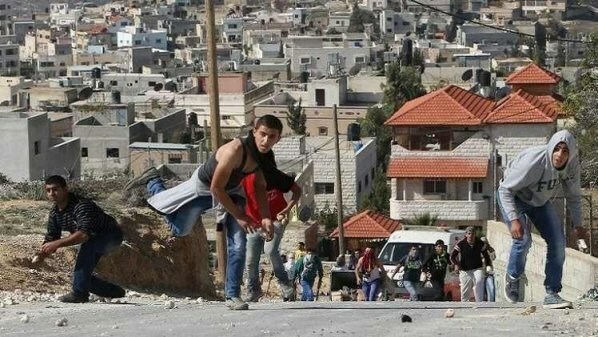 A number of Palestinian civilians afternoon Thursday sustained wounds in violent clashes with the Israeli occupation forces (IOF) in the West Bank cities of al-Khalil and Bethlehem. Local sources in Beit Ummar said a Palestinian boy sustained rubber bullet injury and others choked on tear gas during the confrontations that broke out with Israeli soldiers in al-Daher area. They added that the troops intensively and indiscriminately fired rubber bullets as well as tear gas and stun grenades at the angry young men and nearby homes. Meanwhile, a group of Palestinian protestors suffered from inhaling tear gas during clashes with the IOF in Umm al-Rukba area, south of the Bethlehem town of al-Khader. Umm Rukba has become a flashpoint between Palestinian young men and the IOF since the latter killed 19-year-old Jihad al-Ja'fari from al-Dheisheh refugee camp, south al-Khader town, more than one week ago. open it. Repeated questions for whether they had a warrant to legally enter the apartment were negated and replied with comments such as “we don’t need a warrant” and “I am the law”. 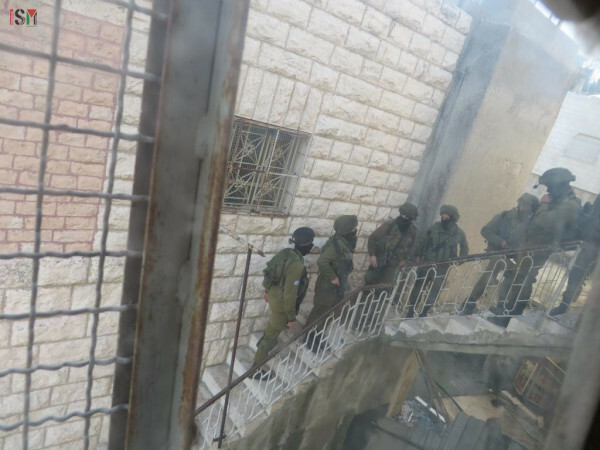 The soldiers also threatened the volunteers that if they don’t open the door “bad things will happen.” In order to stop internationals from documenting and getting an overview of the situation, the soldiers aimed green lasers mounted on their rifles through the apartment windows. The Palestinian Ministry of Health denounced the Israeli storming of one of its medical clinics to the north of Ramallah city. The Ministry’s Public Relations Department disclosed that the Israeli soldiers raided a medical clinic in Ramallah on Wednesday evening. The soldiers blasted open the clinic’s doors and wreaked havoc inside it, according to the statement. The Palestinian Ministry said, in its statement on Thursday, the Israeli attack on the clinic constitutes an offense that breached the international norms and regulations and Geneva conventions. “All of the international conventions clearly stipulate that medical institutions must be neutralized of any conflict, and its sanctity should be maintained”, the statement mentioned. The Ministry called on the human rights organizations along with conerned international institutions to protect the Palestinian medical institutions from the IOF repeated harassment. Israeli soldiers, stationed across the border fence east of Gaza city, fired several smoke bombs and rounds of live ammunition, targeting Palestinian homes and agricultural lands. The Palestinian News & Info Agency (WAFA) said the soldiers, stationed on military towers behind the fence, fired dozens of rounds of live ammunition, and smoke bombs, causing property damage but no injuries. WAFA added that several armored Israeli military vehicles and tanks have been seen driving close to the border fence, and fired smoke bombs, while army helicopters hovered overhead. Earlier on Thursday, Israeli navy ships opened fire on Palestinian fishing boats in Gaza territorial waters, northwest of Gaza city, shot and injured two fishers, and kidnapped four others. A Palestinian official source said that two Palestinian fishermen suffered bullet injuries and three others were detained on Thursday morning when the Israeli occupation navy attacked them off the northern shores of the Gaza Strip. 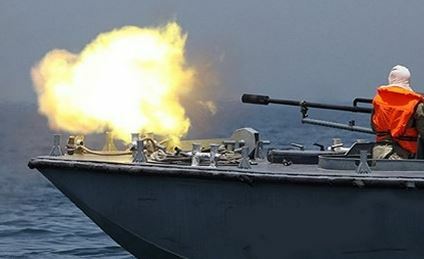 The official source, who works for the Palestinian ministry of agriculture, told the Palestinian Information Center (PIC) that the Israeli navy opened machinegun fire at the fishermen as they were working off the coast of al-Sudaniya area and wounded two of them, identified as Eid Mohsen and Ziyad Fahed. He added that the naval forces confiscated a boat belonging to fisherman Mahmoud Zaidan and detained three others on board, pointing out that another fishing boat sustained damage in the gunfire attack. The Israeli navy did not comply with the Egyptian-brokered ceasefire agreement concluded between Israel and the Palestinian resistance on August 26, 2014, and it has committed, since then, many violations against fishermen and their boats. This agreement includes allowing Palestinian fishermen to sail and fish within six nautical miles in the Gaza Sea; however, all Israeli attacks took place within these nautical miles, which proves that Israel deliberately tightens restrictions on Gaza fishermen and their livelihoods. Israeli navy boats fired, on Wednesday morning, rounds of live ammunition on a number of Palestinian fishing boats, in territorial waters in the Sudaniyya area, northwest of Gaza City. Eyewitnesses said the navy attacked the fishing boats close to the shore, causing excessive damage, and forcing the fishers to sail back to the shore. 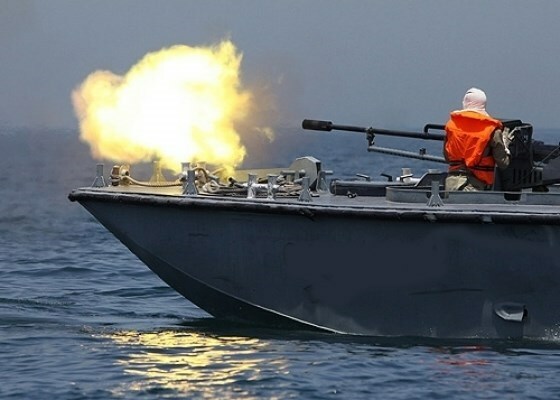 The Israeli navy frequently attacks Palestinian fishers and their boats in Gaza territorial waters, and in many cases while on shore. The attacks led to excessive damage, in addition to scores of casualties and arrests. On Monday morning, Israeli gunboats opened fire towards fishermen's boats in the Gaza Strip, this time off the coasts of Sudaniyya, and Khan Younis. The Israeli Occupation Forces (IOF) arrested at dawn Wednesday eight “wanted” Palestinians in the West Bank, Israeli radio said. Two of the reported detainees were charged with being involved in carrying out “attacks” against Israeli soldiers and settlers, the broadcast claimed. The detainees, including seven from Ramallah and another from al-Khalil, were all transferred to Israeli investigation centers. Meanwhile, local sources said that two other young men, from Jenin, were also nabbed this morning while being in occupied Jerusalem. The IOF also raided Jenin refugee camp and nabbed a young man charged with an alleged stabbing attempt. Another Palestinian citizen was also detained overnight in the city under the same pretext. Also in Jenin, three citizens were summoned for investigation Wednesday morning in Qabatia town as Israeli forces broke into its neighborhoods. A number of homes were violently stormed and searched during the raid. On the other hand, Wadi al-Hilweh Information Center pointed out that violent clashes broke out overnight in Silwan town in occupied Jerusalem after Israeli forces stormed Abassiya and Ein Loza neighborhoods. Heavy tear gas bombs and rubber bullets were deliberately fired towards local residents and their homes in the town, the sources added. An Israeli Undercover Unit has also stormed into Ein Loza neighborhood and kidnapped a boy after brutally beating him. The newly appointed Israeli army Chief of Staff Gadi Eisenkot stated that the Israeli military always needs to be ready for a new Intifada, or attacks against Israeli targets, including the possibility of a full confrontation between the Palestinian Authority and Tel Aviv. His remarks came after the Israeli military concluded, on Monday evening, large-scale military drills in different parts of the occupied West Bank, especially the Hebron district. 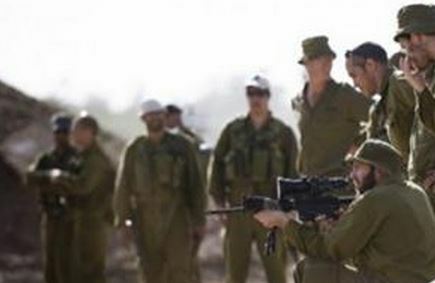 Thousands of Israeli soldiers and military commanders participated in the trainings in and around Palestinian communities in the occupied West Bank, using live fire and different scenarios that included "attempts to abduct soldiers, in addition to bombings or attacks in settlements," Israeli daily Maariv has reported. Israeli military analysts believe the army is concerned about the possibility that the current contradicting political campaigns, run by Israel and by the Palestinian Authority, in an attempt to win international support, could turn into a violent conflict on the ground. 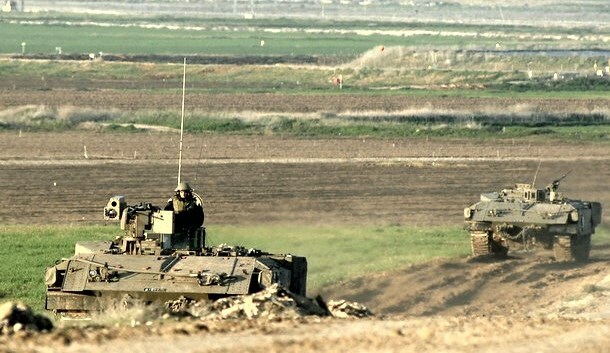 An Israeli military officer stated the current extensive drills, that were held by the army, also came “because in 1987, Israel did not predict it is going to face the first Palestinian Intifada. Eisenkot, who was sworn in as the new Israeli Army Chief of Staff on Monday January 16 2015, decided to start his carrier with live-fire training in populated Palestinian areas in the occupied territories, a move that was seen by various military analysts as a show of force, especially since the drills he ordered were not planned in advance. Israeli Military Initiates Massive Training Drill in West Bank. Palestinian medical sources have reported that several Palestinians suffered the effects of tear gas inhalation, after Israeli soldiers invaded, on Tuesday evening, Beit Ummar town, north of the southern West Bank city of Hebron. 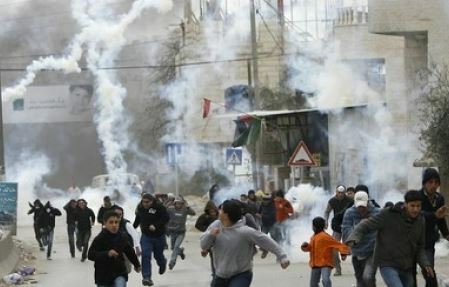 Local activists said clashes took place in the ath-Thaher area, in Beit Ummar, after several military vehicles invaded it, and that the soldiers fired rubber-coated metal bullets, and gas bombs targeting protesters and homes causing many Palestinians to suffer the effects of tear gas inhalation. They added that the soldiers deliberately fired gas bombs into a barn belonging to a local shepherd. Earlier on Tuesday, soldiers kidnapped three children on Tuesday, including a seventh-grade schoolchild, in the southern West Bank city of Hebron, after searching his bag and locating a compass that he uses in his classes. In addition, the Israeli authorities, on Tuesday, sealed off a stone-cutting factory and seized a lorry in the town of Beit Ummar.